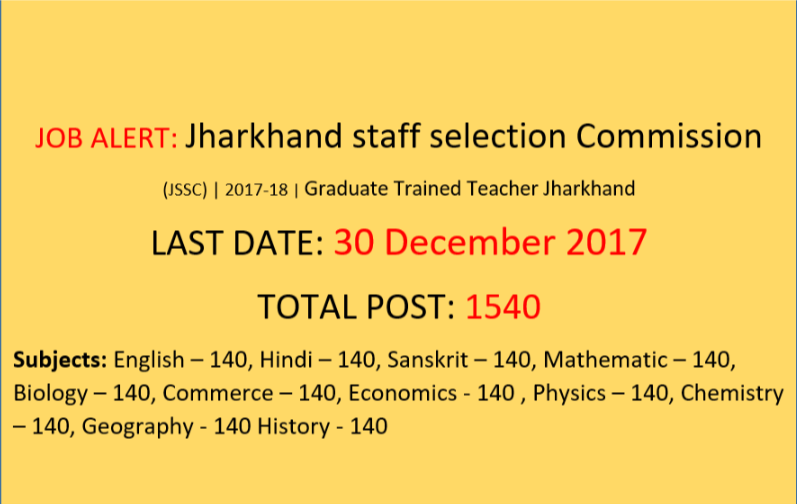 Jharkhand staff selection Commission (SSC) publish notification for graduate Trained Teacher Jharkhand announced. this Recruitment Total number of Post are 1540.in this job interested candidate are apply online form. this website : every consider (www.everyconsider.com) are provide following details like that: Eligibility Criteria, important date total recruitment,,name of recruitment,age limit, most important are that Online apply Last Date 30.12.2017 . Who candidate are interested for this job they can read this Details and Apply soon,we are provide details of SSC such as name of post, monthly pay, age limit, official notifications etc. Eligible candidates can apply online from start 1 december to 30.12.2017 | Other details, like educational qualification, age limit, fee, selection process, and how to apply are given below. 1.The paper will consists of objective type-multiple choice questions only. 3. for LDC Question Paper will comprise of four sections. The question paper will be Hindi/English language and objective type questions. marks of written test 100 marks. 5.Duration of question paper will be of Two hour or 60min. Minimum Essential Educational Qualification. These section are divide in per post. any post for different qualification. Candidates must have the Qualification in Graduation Degree. For More Details read Notification. Notifications link given Below. Last Date for Registration of Online Application: 30 December 2017. Age limit for General Category Candidates will be 21 to 40 Years.. The crucial date for determining the age limit shall be the closing date for receipt of application from candidates in India. Only for the post of Material Assistant and CMD (OG) the age limit for General Category Candidate is 18 to 45 years. selected candidate are get salary- Rs 9300-34800 with Grade Pay . 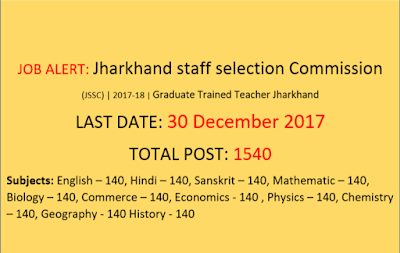 for more details for Pay scale for jssc read notification. JSSC Apply Application Form Processes. 1.Before filling online application, you are keep Graduation record because in need for score. Filling up of information like email id is compulsory if not the make sure. 3. Eligible candidates can click on the link to Apply Online for 1540 Teachers Posts. 4. Read all the details presented in the official advertisement. 5.Fill all the mandatory fields on the application form in the prescribed format. 6.Keep Scan your photo (passport size), signature, all Documents etc. 7.After Fill all section of form than click on Submit Option. 8.Pay the required amount as application fee towards JSSC Recruitment 2017-18. 9.Fill up the form full completely; before Submit button make sure check once again all the details are correct or not.